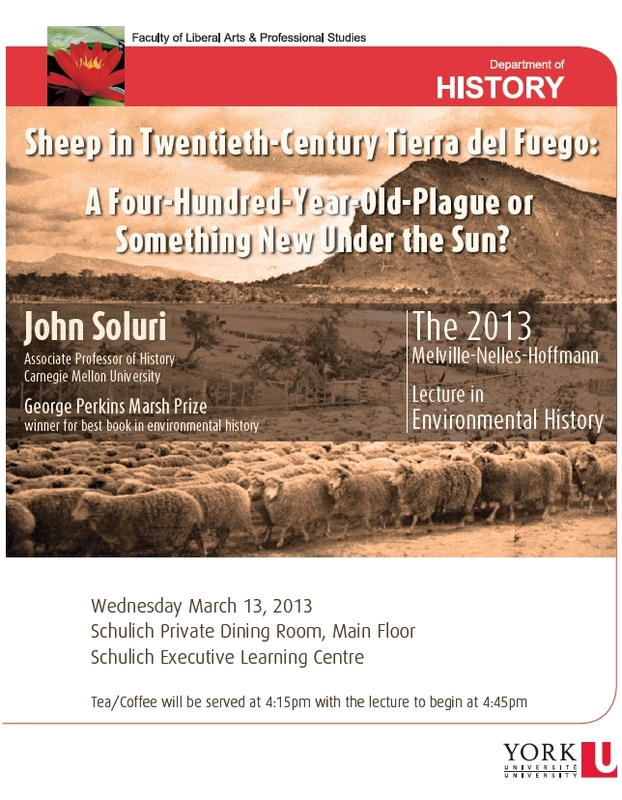 On March 13th, Professor John Soluri will be speaking at York University as the 2013 Melville-Nelles-Hoffmann lecturer in environmental history. His talk is titled “Sheep in Twentieth-Century Tierra de Fuego: A Four-Hundred-Year-Old-Plague or Something New Under the Sun?” With direct allusions to the groundbreaking environmental history research of Elinor Melville and John McNeill, Soluri will explore the ecological consequences of sheep ranches in southern Chile and Argentina in the Tierra del Fuego archipelago. His talk promises to raise questions about how we frame environmental histories in relation to other “great narratives” of history, such as colonialism and economic globalization/commodification. John Soluri is perhaps best known for his award-winning book Banana Cultures: Agriculture, Consumption, and Environmental Change in Honduras and the United States. Winner of the 2007 George Perkins Marsh Prize for best book in environmental history from the American Society for Environmental History, this book traces the interconnections between US and Honduras histories through the banana as a mass market commodity. The rise of banana consumption in the US in the nineteenth and twentieth centuries led to transformations of production in Honduras which resulted in innumerable economic, social, and ecological changes in the Latin American nation. This extraordinary exploration of a century of banana production and trade provides new insights into the history of globalization and the ecological footprint of global capitalism. The Melville-Nelles-Hoffmann Environmental History Lecture is an annual speaking event hosted by the Department of History at York University. It is generously supported by two of the History Department’s founding environmental history professors, H.V. Nelles and Richard Hoffmann and it honours the memory of the late Elinor Melville. Previous speakers in this series have included James McCann, Christopher Morris, and Joy Parr. Audio from last year’s lecture by James McCann is available here.